Singleton Corp manufactures a wide variety of plating barrel machinery to handle most manual and automatic hoist/tank systems. Unique, patented Maxi™ barrel geometry lets you choose sizes to meet your productivity goals. Because you can install a larger capacity Maxi™ barrel in your present tank system, output is increased. (For example, an 18" Maxi™ barrel fits in a 16" barrel line.) Maxi™ barrels place the work closer to the anodes for better current densities and faster plating. 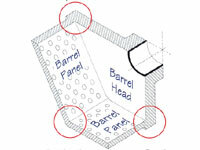 Singleton plating barrels carry a 23% open panel area which delivers the best of both worlds, efficiency and strength. Greater capacity in a standard size superstructure. Fuse-Fab™ fusion welded panels and heads. Available in 3/32", 1/8", 5/32", 3/16", 7/32", or 1/4" perforations. Clamp or knob style door. Custom: length, diameter, and panel thickness. Optional perforations: diameter, profile, pattern (i.e. herringbone, greater open area, etc.). Special: tumbling bars, external girths, partitions. Custom contacts: disc, cup, "hairpin", strip, center bar, chain. Door options: Fully-automatic, sectional, slide-lock, swivel-lock. Low-Boy™ design speeds of hoist transfer time,.Heavy-duty frame and pick-up hook will not deflect when loaded. The angled Dura-Danglers 4/0 cable with sleeves combigns with Horn or inverted-V "floating" tank contacts. In turn, this delivers efficient electrical contact. Stainless steel drive shaft E-Z change bolted hubs and alloy fasteners below solution level mean easy maintenance for years to come. "Bulldog tough" gear drive trains stand up to the test. Singleton barrels are made with premium grade, high temperature polypropylene and innovative Fuse-Fab™ construction assuring quality and durability. Fuse-Fab™ joins sections of plastic material, in a controlled thermal process, creating a single uniform section. The result is a seamless plating barrel with tremendous strength and integrity. Door handles, door ribs and side ribs incorporate Steel-Core™ construction, eliminating warping and parts loss while enhancing overall durability. Steel-Core™ encapsulated reinforcing provides superior strength and extended service life to every Singleton production barrel. Poly-Ripple™ barrel panels have a series of parallel grooves over the entire length of the interior surfaces. Poly-Ripple™ is an exclusive feature of all Singleton production plating barrels. Poly-Ripple™ promotes material tumbling, eliminates nesting, increases current flow to the load, allows faster draining, faster drying and less drag-out. © The Singleton Corporation and SingletonCorp.com, 2019. Unauthorized use and/or duplication of this material without express and written permission from this site’s author and/or owner is strictly prohibited. Excerpts and links may be used, provided that full and clear credit is given to The Singleton Corporation and SingletonCorp.com with appropriate and specific direction to the original content. Find the right machine for your test specifications.